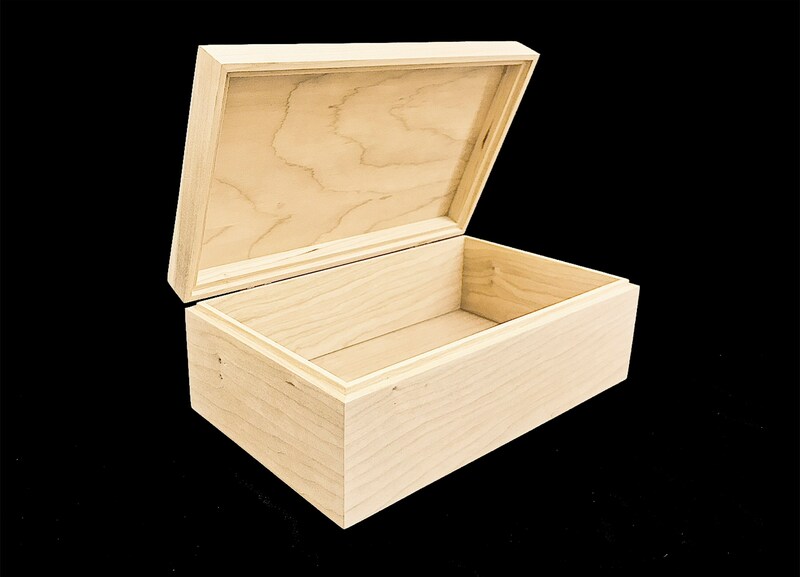 Our boxes are handcrafted from 3/8 inch Poplar, Oak, Maple, or Cherry hardwood. They have a recessed tops and bottoms made from 1/4 inch Maple, Oak, or Cherry plywood. They have an interlocking hinged top with 90 degree stop hinges to support the lid. We sand them smooth so they are ready right out of the box. The outside dimensions of these boxes are approximately 10 x 6 x 3 3/4 inches, with a total inside area of 9 1/4 x 5 1/4 x 3. You can also add a latch or a lock to the front of the boxes for a small additional cost. We can also laser engrave your box to give it a very special personalized touch. Just purchase the link below and send us a message at checkout of what you would like us to engrave on your box. Then we will send you a proof for your approval before we do any engraving on your box. This item is perfect. It is made with skill and is of great quality. The box was also heavily wrapped basically guaranteeing it would not be damaged during shipping (which I really appreciate). I used it for a storage box project and I'm really happy I chose this product. I will buy from this shop again the next time I need something similar! Highly recommend.